“Gone With The Wind” was 1,037 pages which took its author, Margaret Mitchell a decade to write. Then it took 517 pages to correctly document the life and times of this great Southern writer and the romance between Mitchell and her husband, John Marsh. In “Margaret Mitchell & John Marsh: The Love Story Behind Gone With the Wind,” biographer Marianne Walker researched thousands of papers containing correspondence from the Marsh husband & wife team. Letter to family, friends, business associates, and even fans were unearthed to properly tell the tale of this power couple from their start to an untimely finish. 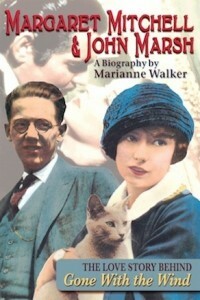 Miss Walker’s effort to research the true history behind the Marshes life together comes to fruition in this biography. For every writer is only brilliant once someone believes in her talent. Heaven cast Mr. John Robert Marsh of Maysville, Ky., to play the editor, lover, business manager and most devoted husband to Margaret Mitchell. the South has ever known. The reader becomes enamored with the fascinating tale which began in Atlanta during Prohibition times. It’s thought the first time John Marsh lay eyes on Margaret “Peggy” Mitchell in a speakeasy he instantly became enamored with her. The last lines of the book have the most profound impact and will bring tears to the end of this biography. “He was there, with calm judgement, quiet admiration, whole souled devotion.” The love John Marsh had for his wife could not be summed up any better. More information about the biography can be found here. Have any of y’all read this powerful work? If so, please let us know your thoughts in a comment below.